Now on display in the kiosk inside the Humboldt County Library are 26 nature themed books created by members of the North Redwoods Book Arts Guild. 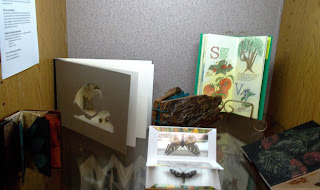 Peggy Marrs water colored plants and animals and bound them into a lovely book. 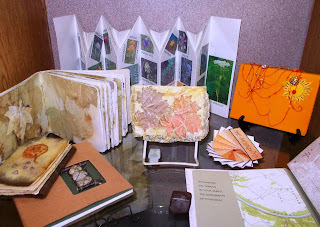 Dolores Guffey used her marbled papers, die cut into tree shapes and placed them in the accordion folds of a book with nature quotes. 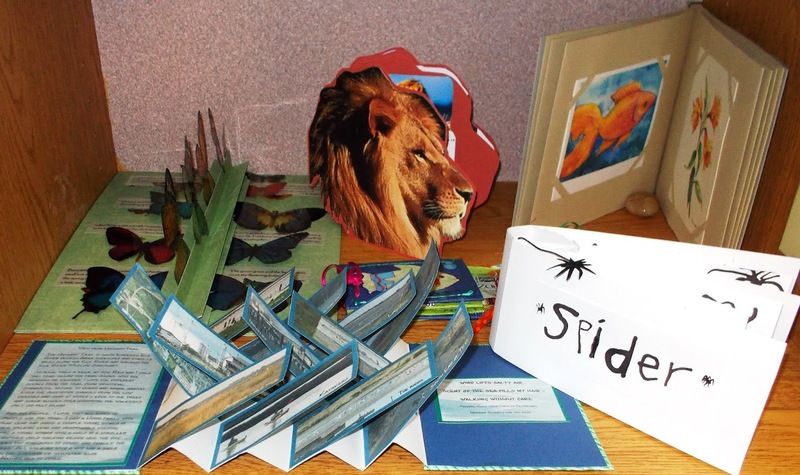 Bobbie Hayes created a flag book based on nature walks along the Hikshari’ Trail. Lynne Gurnee created Mylar windowed views of nature in a piano hinge accordion book. Michele Kamprath used autumn colors and dry leaves to print on black and white papers in a flora book. 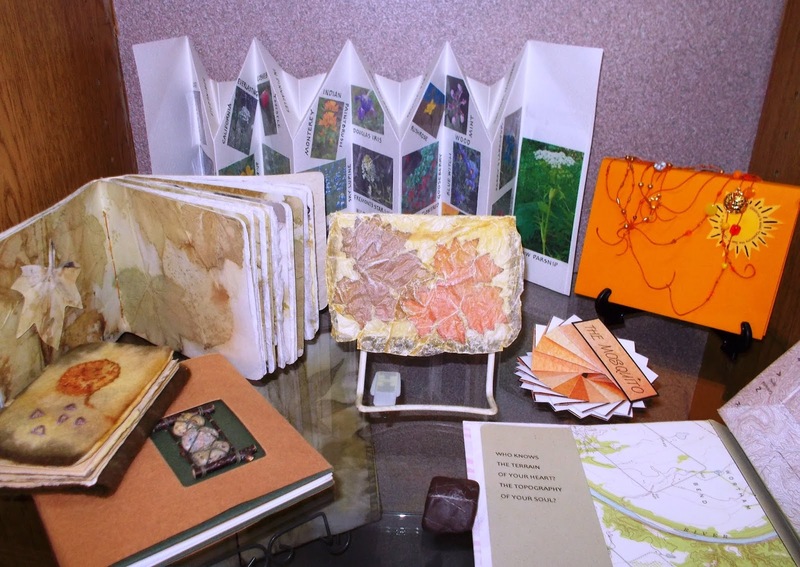 Edith Fuller, in Oregon, made a beautiful book with painted nature prints by a local artist. 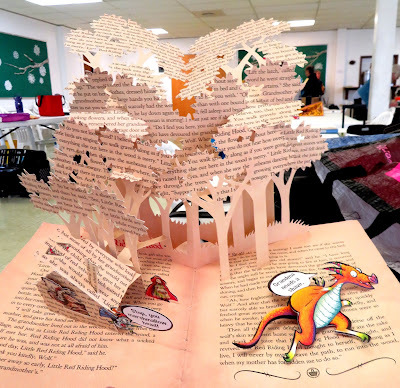 Carole Maurer, in Pennsylvania, hand lettered a whirligig book, The Mosquito, and reminded us that the mosquito is Alaska’s unofficial state bird. And that describes a few of the beautiful books that celebrate our wondrous earth. Our member from York, England, Margaret Beech, knows how to plan ahead. Her motto is "it's never too early to make a start". She recently sent photos of her progress working on holiday cards for the December exchange. She decided to write down how many stages are involved in the making of one card...multiplied by at least thirty for the exchange. So far there are 17 stages including the signature. At a certain point she'll go into production line methods which will speed things up, but it's a while before she has a finished card. 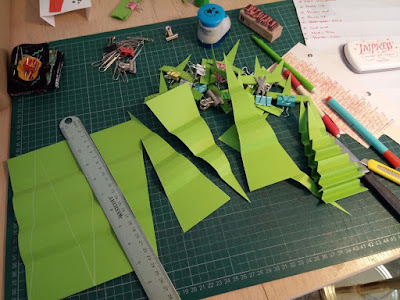 She writes "it's always easy to make one card, but I need to keep in mind how easy (or not) that will be to scale up". Here's a sneak preview of Margaret's holiday card...now get busy on yours! Planning ahead for the coming year of exchanges can begin as early as November when the new themes will be revealed. While some people work best under pressure, others need to plan ahead without a deadline looming. Of course some themes remain the same each year such as Valentine cards in February, Project Page or ideas from the compendiums in May, and the holiday cards in December. But once the new themes are released, consider choosing your favorite (no matter what month it is scheduled) and begin work. It will feel good to be "ahead of the schedule" and perhaps it will even help to inspire you for your next book, maybe the one that has the most difficult theme. 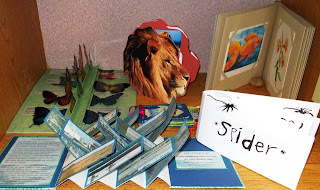 Thank you Margaret for sharing your progress on your holiday cards and for being an inspiration for so many aspects of book art. 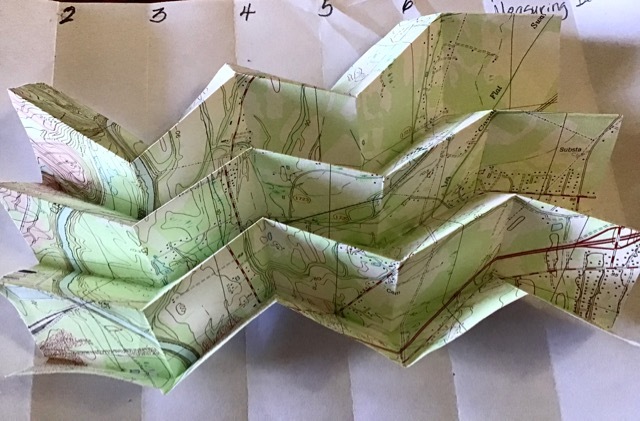 The April workshop will feature Melissa Brown teaching an origami fold that is used by NASA. Although we won't be deploying solar arrays, we will learn how to transform an 8 1/2" x 11" piece of paper into a flat, compact 1" x 4" packet. This fold is named for its inventor, Japanese astrophysicist Koryo Miura. Bring a pencil and your favorite bone folder, but ditch the ruler. Melissa will teach us how to use a piece of paper to divide our project into even sections. No measuring (whew!). If you want to decorate your project, feel free to bring pens, pencils, etc., but that's extracurricular. The March 2019 meeting was very busy. Hedi Kyle structures were the theme. We had a total of 22 exchange books. Our “Show and Tell” table was full too. And the workshop had about 21 of us. Lots of things to see and do. Lara Cox taught us the Hedi Kyle structure from The Art of the Fold found on pgs. 144-147. The structure is a marriage of the simple accordion fold and a piano hinge. The pages are made from a double length folded in half with the folded edge at the fore edge. Then we cut a window through the entire page and put a mylar pocket between the folded page and filled it with things of choice. Those windows can be viewed separately, but also as a marriage of images because they are all see through. This was an unusual workshop. It sounds like it should be easy and quick. 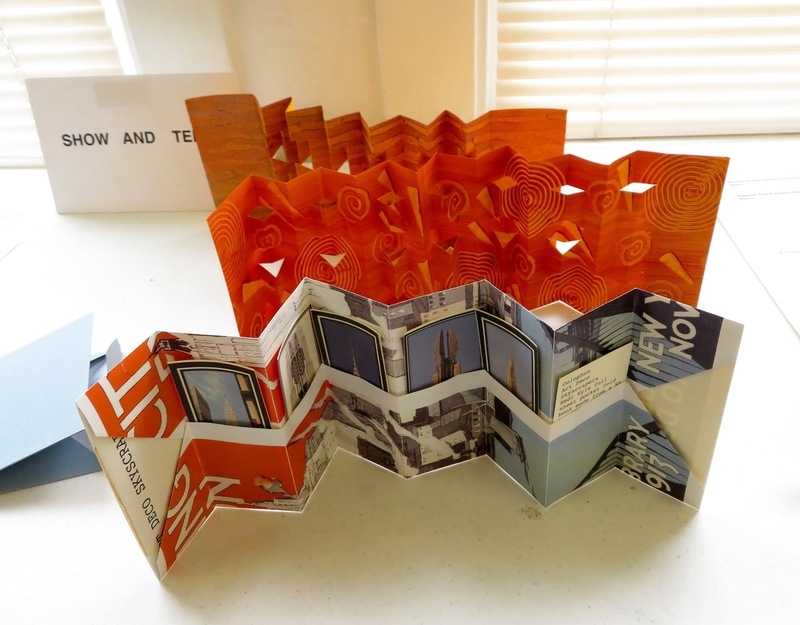 Fold an accordion, make a few cuts on the accordion spine, fold the pages over, cut out windows, fold mylar, put “stuff” inside the mylar. Done and done quickly. That did not happen on Saturday. Lara led us through all the steps easily. There were a few questions about where to cut the accordion that were immediately resolved. But things slowed down with the “put stuff into the mylar pockets.” Also, the marriage of structure and content was delightful. Our members, recognizing that you would see the contents of a single page and all pages at the same time, recognized the need for thought and creativity. We don’t have a lot of finished books because people wanted to spend time working on content at home. 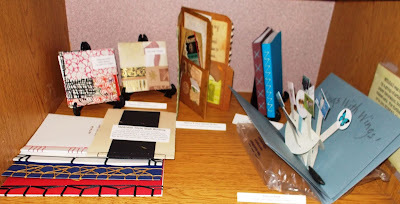 The members will bring their finished books to the next meeting. Lara brought several examples of this structure. The square cut from the cover is much smaller than the interior windows. It gives a taste of what is to come. or simply concentrate on the topmost page. This sample shows how the contours of the book can be changed. This is the interior of the above book. Lara has an unusual paper being used in the windows. She explained that she was doing suminagashi and between prints, she used a torn strip of paper to remove the unused ink. She saved them and they are the contents of these mylar pockets. to make sure that the horizontal cuts in the spine were identical. The vertical cuts were different from end to end so the piano hinge worked. would hold the "hotdog on a stick" piece of wood stay in place. Checking for fit of the stick. the marriage of the two structures was easily seen. The pages will be affixed to the accordion. Spine finished, we folded the double length pages in half and using the orange jig, cut a hole in each folded page. 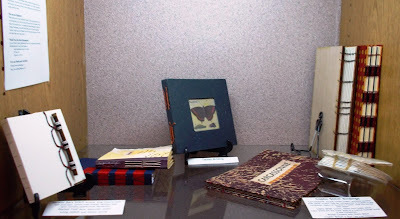 In this picture, the folded edge of the light blue/lavender page is on the left. to make sure we didn't leave any fingerprints on the mylar. As usual, each member brought their own creativity to their pages. This member is using a background photo with geometric shapes floating above. Next comes someone with photograph cutouts and lacy sheets. This member brought some mylar that had been used as a pastepaper base. Interesting? Yes! Threads. On several layers of pages. Just scraps (as shown in Hedi Kyle's book). structure as well as works in process, experimentation and awesome books. This was the March project page. This is a pop-up book that actually used the book pages for the pop-ups. As usual, we laughed, we worked, we had fun! If you have made it this far, go back to the top of the blog and click on Flickr gallery. The exchange pictures are up! A number of mini NORBAG groups have sprung up in various parts of the country. The Pennsylvania group, Bound Together (BT), has nine members and has been active since 2004. Six members also belong to NORBAG with several of them participating in our monthly exchanges. The BT group began with six members and five of them are still in the group. To date they have completed over 40 projects. They meet four times a year at each others homes and have a holiday gathering usually in January at a nice BYOB restaurant. They started out making an edition of the chosen topic so that each member would receive a copy plus one to archive. Last year they decided that was too much so now they exchange with only two members at a time and skip the archive copies. With this system they figured out that it would take two years for everyone to receive a book from each member. 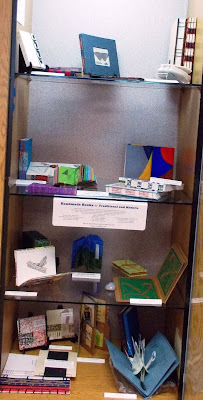 Once a year they also make a collaborative book where the rules are set for size, type of paper, etc. and then they get together to exchange contributions and bind their own copy. 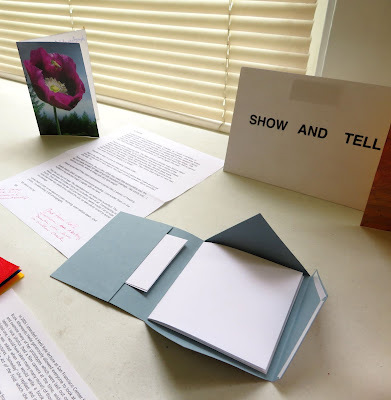 Mary Elizabeth Nelson (NORBAG member since 2011) has shared some wonderful exchange books and ideas with us. 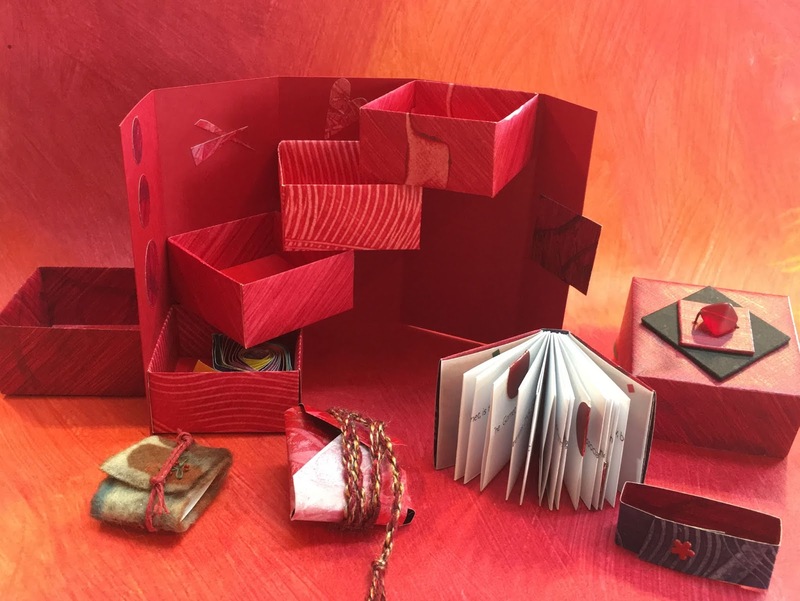 She sent the following photos of boxes that she made for her exchange partners this month. Mary Elizabeth received one of these Treasure Boxes in a NORBAG exchange a couple of years ago and now the structure will be passed on to her BT group. The theme for this exchange is Gems and Jewels so she chose to feature the birthstone of the two recipients. Garnet was the birthstone used for this box. Paste papers were used for both boxes with aquamarine featured here. We would love to hear from more mini groups of NORBAG members who get together in other parts of the country. 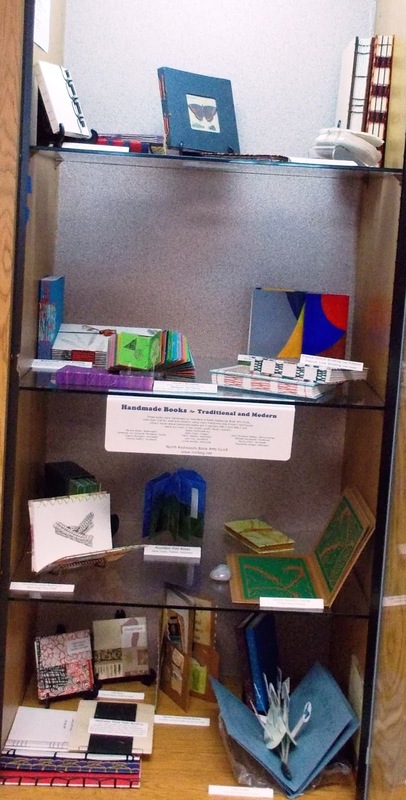 Many thanks to Mary Elizabeth for providing us with this information and the photos of her beautiful boxes. 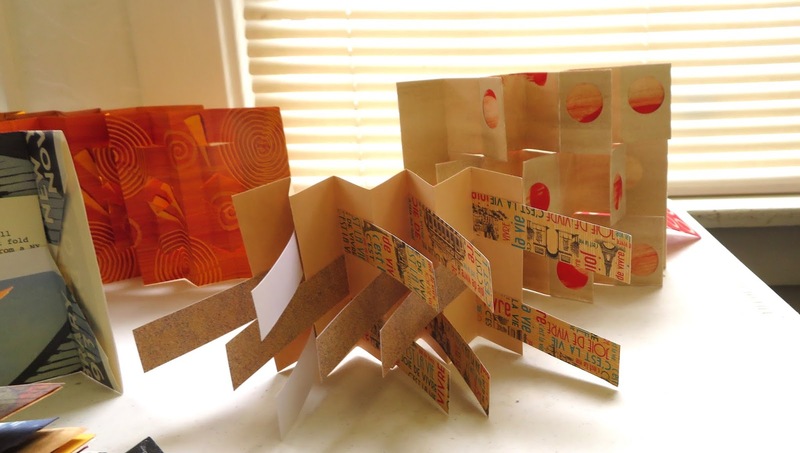 The March NORBAG workshop will feature Lara Cox teaching Hedi Kyle's Piano Hinge Accordion book. This book structure is a variation of the piano hinge album. 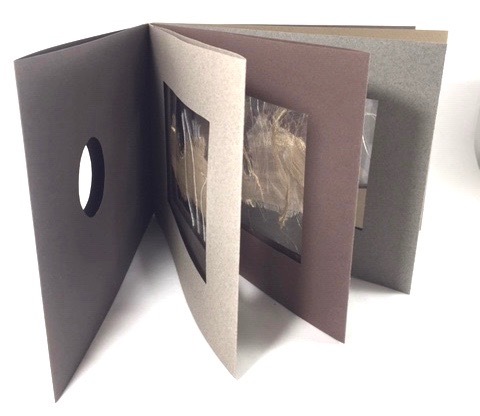 A fun part of the structure is the individual folios which feature window cut-outs filled with Mylar inserts (pockets). The Mylar allows light to pass through the pages, creating shadows, reflections and see-through parts depending on your design. 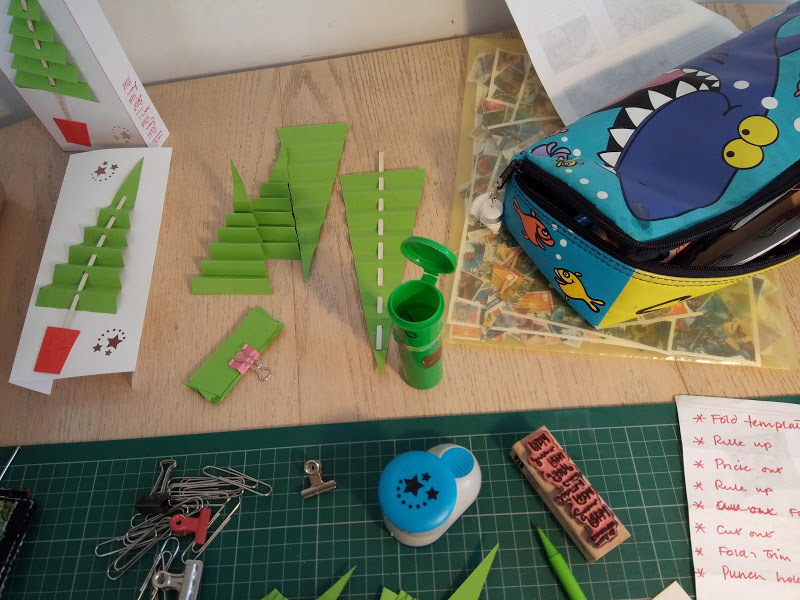 This allows the maker to run wild with content such as collage material, stencils, prints, drawings and photographs to name a few options. Content for Mylar pockets such as cutouts that produce shadows or other ideas such as mentioned in the above description. Please note that there are four pages and the see-through part of the pages will measure 3.5" tall x 5" wide. For the accordion hinge: One (6" x 12") piece of text weight paper (90 gsm). For the pages: Four (6" x 17") pieces of cover weight paper (Mi-Teintes works well). For the covers: Two (6" x 17.5") pieces of cover weight paper such as Mi-Teintes. For the pockets: Mylar sheets (Four pieces measuring 4.5" x 12"). RSVP: Yes, to Lara by Wed. March 8 (contact info in the newsletter). 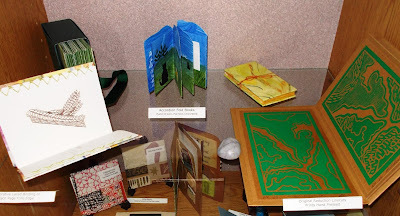 Handmade books using many traditional and modern techniques are now on display in the kiosk at the Humboldt County Library. 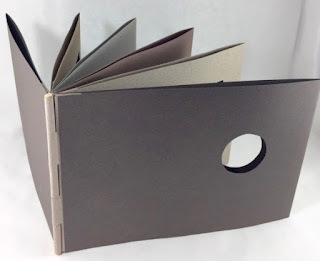 Various kinds of book bindings such as single and double needle Coptic, Japanese stab binding, French Link, Secret Belgian, Slinky, and Long Stitch are included. There are small folded books containing pages of poetry, a multi-page pop-up book, and several Accordion variations including one with decorative lacing on the fore edges of each page. You will also find examples of surface designed cover papers, original lino-cut reduction prints, eco-dyed, watercolor, and paste papers. It's an extravaganza of handmade books by members of the North Redwoods Book Arts Guild.